Of all London’s most accessible escapes – ‘daycations’, if you will – none are quite like Brighton. Less than two hours from St. Pancras (quicker by car), the illustrious seaside resort is as far-cry from so many of the UK’s dilapidated coastal towns best forgotten. It’s ‘Soho on Sea’, but with considerably less scooter-riding muggers. A creature of habit, I usually find myself eating at La Choza, a cozy Mexican restaurant, when in Brighton – or MEATliquor if I’m feeling particularly gluttonous. That’s if I haven’t guzzled 138 doughnuts on the pier for lunch. Opened far more recently, Pascere is a warm, convivial space in the heart of Brighton’s Lanes, launched by Amanda Menahem – Food and Drink Editor of Platinum Magazine and Director of People, Places, Food. 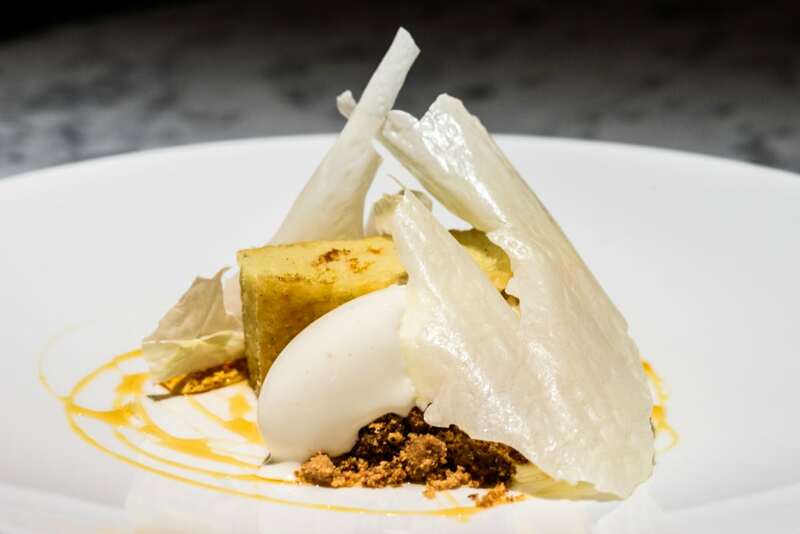 In the kitchen, Head Chef Johnny Stanford is an ineluctable chef to watch, even by London’s often supercilious standards, serving the sort of creative, elegant food that wouldn’t seem out of place at London restaurants such as Lyles or 108 Garage. On a wet mid-week lunchtime, Pascere is surprisingly quite busy, with just 37 seats set across two levels. Both floors have large windows that peer out onto the streets and allow natural light to flood the teal dining room, lending a sense of warmth – even on a devastatingly typical late August afternoon. On the four days of the year when it doesn’t rain, Pascere also boasts an outdoor terrace, with extra space for 16 covers. 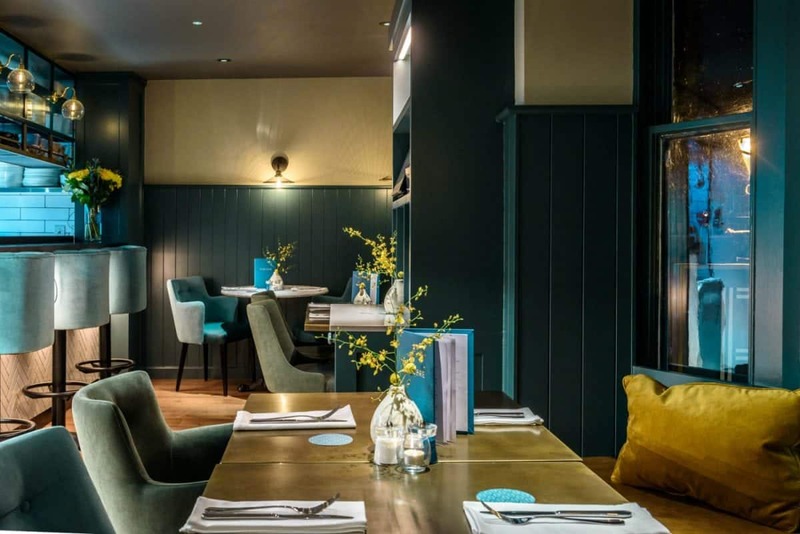 On the menu, Johnny Stanford’s a la carte offering is joined by a selection of small plates, plus a tasting menu only available in the evening. 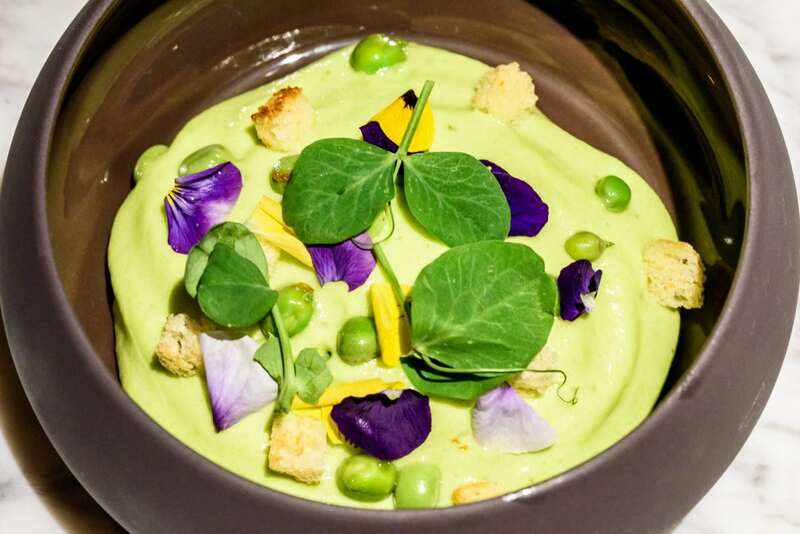 On paper, dishes such as ‘English pea custard with toasted lavender brioche’ read like a tragedy of Shakespearian magnitude, but – against all odds – it’s actually quite delicious. More of a velouté, the chilled liquid is rife with the resplendent taste of pea, feather-light and embellished with some fresh, raw petit pois and pea shoots cleverly accrued for enhanced texture. The taste of lavender is, fortunately, almost indistinguishably subtle. While we wait for the pea “custard”, a fine crab tart is daintily assembled with the light touch of a tooth fairy. Tartlets of paper-thin pastry are filled with fronds of Portland crab meat then capped with fittingly brackish “shellfish custard”. The absolute highlight of small-plates sampled: cured trout is unmistakably fresh with lurid vibrancy, crowned with a small quenelle of horseradish cream that’s been tried and tested to the point of overstretched monotony in fancy London restaurants. At Pascere though, the combination is bracing and a welcome introduction to the subsequent main courses. Simply presented, ribbons of pappardelle are topped with a hulking slab of slow-cooked ox cheek. Arguably the cow’s most ludicrously delicious offering, here the cheek hasn’t been cooked to the point of complete submission, slowly disintegrating in the mouth, not on the plate – in favourable contrast to the soft pasta. The pasta is somewhat pallid, but the parsimonious use of egg in its dough is also appreciated given the ox cheek’s serene richness. Better still, the presentation of the duck dish is somewhat noisy, but pretty as a picture. A halved Goosnargh duck breast is cooked to a degree of perfect Parisian gastro-temple pink, accompanied by some braised chicory leaves, drizzles of garish pistachio sauce and contrasting black cherry gel, complete with a wedge of the most decadent duck liver parfait rolled in desiccated pistachio nut. The combination of duck and cherry is a time-honoured delight, with the fruit sweetness complementing the duck’s lush gaminess. The pistachio elements, on the other hand, act as an agent of reeling all of the flavours together into one coherent, outstanding dish. To finish, buttermilk sponge is dense and unremittingly sweet in a manner that’s disturbingly sating, though the blister of milk skin draped over the top of the dessert isn’t needed, especially when joined by milk ice cream. Chocolate mousse, on the other hand, features a puck of mousse more solidified that typical. In hindsight, the dessert is too rich to follow the cheek (but I’ll take the blame for ordering gluttonously). The mousse is, however, silky and refrains from becoming fussily overcomplicated. It’s also remarkably delectable – just like almost everything else devoured through lunch at Pascere. Pascere can be found at 8 Duke Street, Brighton, BN1 1AH. Previous PostHas fussy eating created our food waste crisis?